Also change of times for Wednesday golf (last minute change, looks like times brought forward by one hour). This week we had 40 golfers (10 teams) in the popular texas scramble. Most of the day was played in cold, wintry conditions, but no rain fortunately. Apart from the winners, only 3 strokes separated the next 8 teams – as usual this format was closely contested. Graham, Pete, Joe & Ray…. Next week is the first major of the year, the Anniversary Trophy which was won last year by Dave Wareing and Kjell Mundheim. A change to the format though, it will not be a completely random draw. You can choose your own partner then there will be draw for opponents and starting times at 8pm Wednesday February 1st in the Clover bar. On Monday 6th February we go to Las Colinas – due to cancellations there are a couple of spaces left for golfers. Also to look like a team on the day can everyone wear red shirts – we know that this year’s white ones are selling well, but they are not official until the start of the golfing year on April 1st. If you have preferred partner for either of the above events, email Dave Lloyd (dave@cdagolf.com). A change to the Christmas and New Year competitions this year – no bring a bottle or present. Some have been disappointed with the quality of gifts donated, so back to a 2€ sweep. Maybe Santa will still pay a visit to the presentation though! In the last couple of weeks there has been an informal meeting with Enrique Herrero (owner of Alhama Signature Golf) – no demands from either party, just an exchange of information. The greens have been infected by a type of grass that is difficult to remove. The greens will be replaced with replacement turf which is being grown at the far end of the practice area. This is also a problem at the other IRM courses. We will now receive green fee vouchers for certain special events that take place on a day other than Friday -e.g. Viking Cup, St Patrick’s Day, St George’s Day. Also Condado hopes to host a professional event sponsored by Canal+………… (televised?). The hollow tining program will be different…………..the greens will now be treated using a different system – using high pressure air which is blasted under the green. This avoids the closure of the course. All the pumps on the course have now been repaired – this was the reason for the empty lakes. The lakes are now more or less full and the intention is that they will remain so. One course membership of Condado is not possible at the present time as the short term financial plan is to keep the original 6 Polaris courses as a group. Also the 3 owners intend to still honour the golf debentures. The membership and reduced owner’s fees will only be offered to owners and renters who can produce a contract for a minimum of 6 months, short term renters will now not get resident’s rates. Enrique suggested that we have a few meetings every year to ensure that standards between the society and the management continue at a high level. The bunny problem is being addressed with a catch and release program, so bunnies are not being killed. And now to lighten the tone………………………………..
My problem with the Grand Canyon is that the Americans are just too proud of it. The Grand Canyon was like that when they found it, and let’s be honest………..it wasn’t too hard to find. In a similar vein, it must have been even easier for Columbus to find America – it is rather large! Just because no one complains, doesn’t mean all parachutes are perfect. The talking point this week was the white stuff on Condado. 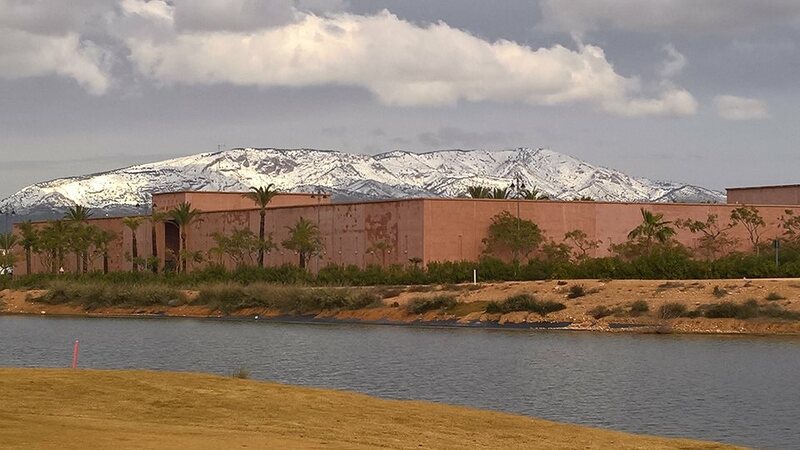 Some people around the Murcia area have NEVER seen snow, so it was an historic moment for all. Unfortunately I was out of the country and missed it and believe it or not, I was gutted! It was forecast, and started on Wednesday when some brave golfers were out on the course. They managed to reach the 11th before their balls refused to roll any more! and that’s it………..can’t play golf with a snowball…..
Neil Simpson, Ken Saunders and Tommy Toner back in the bar……………. Lots of photos from Don’s drone – think this is a good one of 9th and 18th…………………………..
Amazingly the course was clear in a couple of days and was open for play on Friday – the only stipulation being that buggies must remain on the cart tracks, as was the case at all the other IRM courses. Some of the others suffered major damage to the bunkers (which were ruled G.U.R.) although ours were fine. The two in form players came out on top again – Chris McAllister just got back from the U.K. in time to take the 1st division, whilst playing partner Kevin Smith won the 2nd division. Only 22 players trusted the weather to stay fine, and they were proved correct. Is Kev really taller than these two? Here are a couple of reports which are also available on our Handicap Master system – ranking of hole difficulty on the day, & leaders in various categories (which may sometimes be used for extra prizes)…………………. This is what happened in Condado between Wednesday and Thursday………..
these are the starters in place for Friday golf………. and from the golf club rooftop……………..
All golfing places for Las Colinas have now gone, just one or two spaces available for any ladies who wish to go on the shopping trip. Next week is a texas scramble, followed by the anniversary trophy on February 3rd. The bus for the evening is now full, but tickets can still be purchased from Alicia at 15€ if you can make your own way to the Sensol hotel Camposol. Thanks for this video of the snow with commentary from Denise……………..
and a couple of jokes to fill out the blog……………………. My wife has been missing a week now. The police said to prepare for the worst. So, I went down to Oxfam to get all of her clothes back. a different viewpoint of the 10th hole – what a difference a full lake makes! The greens staff have been working really hard to repair damage from the recent rains – here they are working on the bunker on hole 10……………. This week was the yellow ball, where when it is your turn your score counts double – but it is only yours and one other score counting, so the pressure is on. 32 players formed 8 teams who played in lovely sunshine, although the wind caused problems and so did many of the pin positions. The winning team scored a very creditable 115 points, but all the rest struggled desperately. Only 97 was good enough for second, and the bottom score was just 76 points – you know who you are! Dave Lloyd, Kim Lloyd, Ken Saunders, Alicia Saunders………………115 pts. Neil Simpson, Kevin Smith, Chris McAllister, Barry Barker…………97 pts. Dave, Kim, Alicia & Ken with captain Neil…………. The trip to Las Colinas on February 6th is now full for golf, but still a few places on the bus for any ladies who want to go shopping…………. Just been to the gym. They’ve got a new machine in. Could only use it for half an hour, as I started to feel sick. My psychiatrist told me that to achieve inner peace I need to finish what I start. So far, I have finished 2 bags of M & M’s and a chocolate cake. I feel better already. Chris McAllister has transformed the dull, dreary, dark Clover bar into a modern, trendy and welcoming sports bar which is essentially a pub with all sports available (5 screens including large screen). Also Cath has introduced an interesting choice of snacks and meals which, whilst not being recognised as a restaurant as such, has enough choice to satisfy the most fussy of eaters. 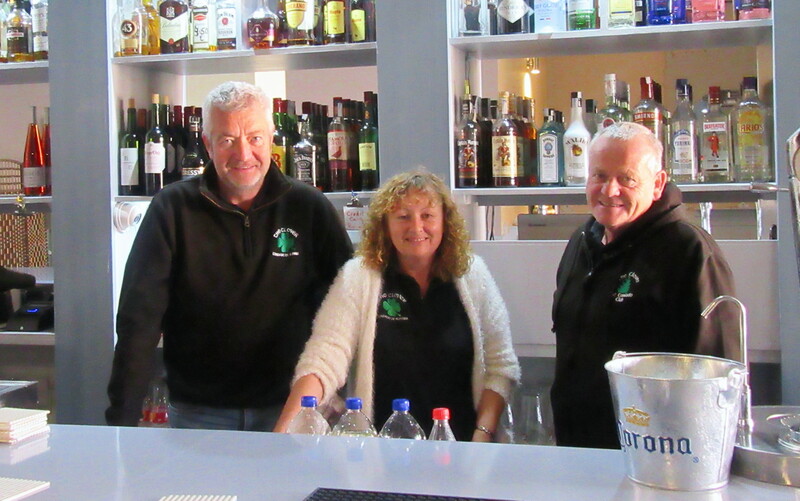 The management team of Chris McAllister, Cath Emmett-Smith and Kevin Smith are running the bar with the needs of customers in mind. The atmosphere has changed with the brighter design and a varied choice of drinks and food. The stage has been opened up, with the uprights and railings removed, so there is nothing to distract from the entertainment provided each weekend. The old cocktail bar (which was never used for that purpose) has been the home of the golf society’s treasures ever since Neil and Lynn Simpson gave that area to us when the society was formed in 2010. I always thought that the trophy cabinet was very impressive, comparable to many golf clubs in the U.K. All it needed was some history, and the last seven years have set us well on the way, with a fine collection of trophies. Now the honours boards have been added, which will immortalise captains, major winners and hole in one achievements. The golf corner is adorned with golf memorabilia around the walls, with photos of Severiano Ballesteros (the inspiration for our annual charity event), Jack Nicklaus (who designed our course personally, thus it is a signature course), and an original map of the layout. We also have Ben Hogan, and shortly will have a shirt donated by Matthew Fitzpatrick (Ryder Cup player 2016). the ‘hole-in-one ‘ honours board has been added to complete the set……….. Probably the most iconic photo ever of the late, great Severiano Ballesteros at St Andrews. Not only has the golf corner been modernised, so has the rest of the bar. the dart board area – Phil Taylor couldn’t complain here……………. the pool players are out of the way………………. Rugby Union memorabilia in the games area………. But at the end of the day, it is a ‘YORKSHIRE’ sports bar, and Chris wont let you forget it! there also 3 new mirrors installed around the bar, which create a sense of space. So it is like a new bar in the square, book a flight and come out and try it! that reminds me – January 6th, time to take the fairy off the top of the xmas tree…………. The first competition of 2017 attracted a field of just 26 golfers. When the rain started on the 9th I was ready for off, but it was short lived and also brought with it a rise in temperature. It was very promising to see almost all the lakes full and as you can see below, water is currently being pumped into the hazard on hole 5. Apollo Air (air conditioning experts) have kindly agreed to sponsor the monthly competition throughout 2017. Also Paul Culligan has confirmed his continuing sponsorship of the Dublin Crystal for 2017 and 2018. Anthony was 1st division winner…………………..
and Kev won division 2……. The new system (HandicapMaster) is now operational, and players need to enter their own gross scores for each hole on the computer in the bar after play. But please check that you have highlighted your own name first, otherwise you are giving someone else your score and they cannot then input their own. Water is also still going into the 4th hole – soon all lakes will be full to the top. It is noticeable that wildlife is coming back (herons etc.) and the eco-system is returning. the lake on the 4th looks full again…………………. and there is water at the far end of hole 5………..
10th/11th is full again and gives a much nicer view from the penthouses………………..
the 18th is full and still as a mill pond – my ball is in the middle of those clouds…………………………..
Fresh sand has also been added to the bunkers following the recent rains and they are now in excellent condition. At last the refurbishment of our golf society corner in the Clover is complete. That area is dedicated to our trophies and honours boards, along with other golf memorabilia and photos. Thanks to Jeff Lightle for purchasing a ‘hole-in-one’ honours board. Anthony Howell was the go-between with the manufacturer and Ricky Comber actually brought it over from the UK. All we needed then was for our master joiner (Kevin Smith) to find time to install it! Lots of good players not on this board………. only the lucky ones! A reminder that the green fee with the society is only 37€ (including buggy) during January. We will get the same deal in June, July, August and December. The green fee vouchers we give out as prizes etc. have a redemption date of December 31st 2016, but this has been extended until February 28th 2017. There are still 5 vouchers outstanding, so someone has them. Contact us if you have one. Just one place left for the away day at Las Colinas on Monday February 6th. Shirts and diaries can be collected on Wednesday and Friday nights (15€ shirts, diaries free). Next week is a 4 person team yellow ball. And there will be more jokes this year. Here is a classic from Laurel and Hardy………..
Oliver Hardy……….Didn’t you once tell me you had an uncle? Stan Laurel…………Sure I’ve got an uncle. Why? Ollie…………………..Now we’re getting somewhere. Is he still living? Stan…………………..No, he fell through a trapdoor and broke his neck. Ollie………………….Was he building a house? Stan…………………..No, they were hanging him. Another fantastic year for our Condado de Alhama golf society, so much has happened, and the months have flown by. We are grateful for all the sponsorship we have received over the year………….. Sorry if I have missed anyone, but all help is very much appreciated. Norwegian golfers Ellen and Karin both had a two!……….. I know Ali was one winner of the booby prize – perhaps the other lady would prefer to remain anonymous?………. 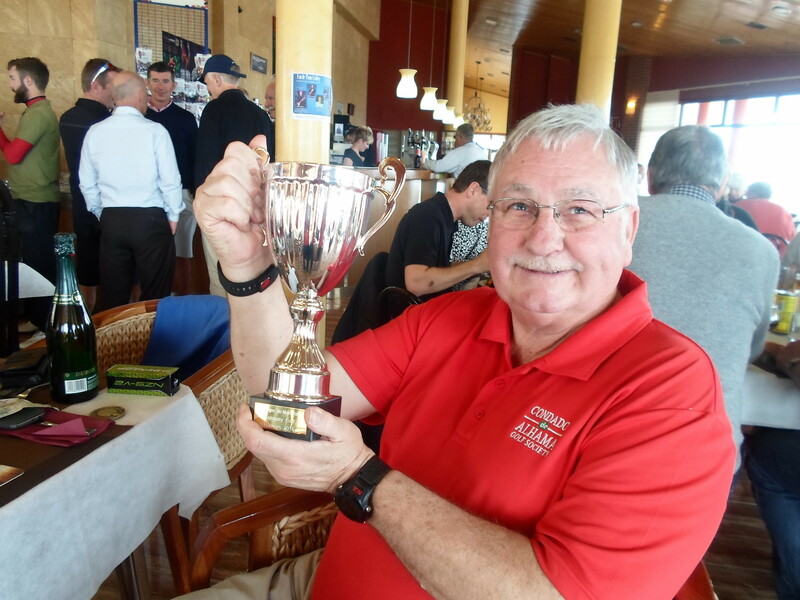 The Seve Trophy raised 3000€ thanks to lots of businesses and individuals…..
And of course we are grateful to everyone who volunteered to act as starter on Fridays – here Martina Alwell does her stint…………………..
And as a matter of interest, the blog does attract a lot of attention. This year there have been almost 60,000 views from 15000 visits, so maybe there is something here that brings people back. It is basically to inform members what is happening here with results, news and general information. Hopefully the photos paint the pictures, so being away is less painful. And I hope that there is not only Gerry who appreciates the occasional jokes when material is short! Kevin continues to provide our members with a society shirt each year – only 15€ (cost price). Here is Barry Answer modelling this year’s red version, and next year a colour to go with anything – white! Our weekly raffle has made it possible to provide a free bus for our 4 awaydays and major off-site events. And of course there was free entertainment on the bus! a variety of shirts, but we were together………. In May Dave Lloyd passed over the captaincy to Neil Simpson, who then appointed Ken Saunders as his vice-captain. Barry Barker was voted in as lifetime vice president. On site the Clover Bar still continues to be an excellent base, with the cocktail bar area dedicated to the society. Neil and Lynn have been instrumental in making our society so successful, and passed on the reins to Chris McAllister and Mikey. This partnership has ended, but Chris and the team have done a fantastic job in transforming the Clover Bar into a bright and welcoming place which we hope to use for many years to come. On the course we have again got new owners, now GNK – let’s hope this is positive news and the course achieves the recognition that its design deserves. This year has seen lakes full, then empty, and now – just almost there…………. January, Pete Elgar wasted his time securing lilies in the lake……………. And we are always up for a party, to celebrate whatever………………………. Kev, me, Neil & Ken…..
Members of the winning Viking Cup team celebrate UK & Ireland take a 4-3 lead in the series……………………………………..
Neil made sure we remembered his 50th birthday party!………………. And congratulations to the many golfers who won a major or special event – handicaps do work because there are so many different names……. And so that is a look back at another great year, onwards and upwards……….